A majority of letters to the editor that appear in newspapers are written by men, which means a sizable chunk of the nation isn’t taking part in the national conversation. Joyce Ehrlinger, assistant professor of psychology at Washington State University, said that women are hesitant to position themselves as experts. 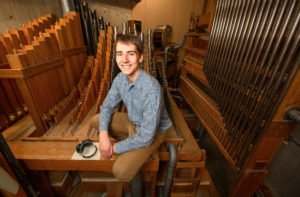 College of Arts and Sciences sophomore Thomas LeClair is trying to fix a 91-year-old theatre organ he found languishing in the basement of Webster Physical Sciences building on the Pullman campus. Thomas LeClair works on the old pipe organ. A biology and music double-degree student, LeClair discovered the existence of the instrument while thumbing through old files in the WSU Libraries Manuscripts, Archives and Special Collections. In 1927, early Pullman developer P.W. Struppler purchased the organ now in Webster to accompany silent movies at the Spanish Colonial style Cordova Theatre, which opened on Grand Avenue in 1928. The old pipe organ was donated to WSU in 1961 and installed in the physical sciences building in 1975 at the behest of then-chairman of physics Edward Donaldson for studying musical acoustics. Washington State University theatre faculty Benjamin Gonzales and Mary Trotter received separate awards for outstanding and innovative teaching at this years’ Kennedy Center American College Theatre Festival Region VII, held Feb. 19-23 in Spokane. Gonzales, a clinical associate professor and WSU faculty member since 2003, received the Horace Robinson/Jack Watson Award. It is presented, each year, to a Kennedy Center American College Theatre Festival (KCACTF) Region VII faculty member who has shown dedication and support for their students above and beyond the normal duties expected of university faculty. Trotter, a clinical assistant professor at WSU since 2011, was awarded with the Region VII Association for Theatre in Higher Education (ATHE)/KCACTF Prize for Innovative Teaching. This prize is awarded for innovative teaching that supports student success in the area of theatre arts. KCACTF Region VII includes Colorado, Wyoming, Montana, Idaho, Washington, Oregon, Alaska, northern California and northern Nevada and is attended by more than one thousand faculty and students each year.